Contest Winner! And a new WIP. . . .
Before I reveal the contest winner, I just want to say that I am going to be discussing the new Rockin' Sock Club shipment. So, if you haven't received yours yet and don't want to see it, please save reading my blog for another day. Moving on. So, now we have the moment we have all been waiting for.....the winner of the coveted skein of Mariners Yarn. I had 120 entries this contest (it's amazing what Ravelry does for the blog sometimes!) and the random number generator tells me that contestant number 74 has won. So, the winner is. . . . Trudy!!!! (I have emailed you Trudy about how to retrieve your skein o' yarn!). Thanks for stopping by my blog everyone. I enjoyed reading everyone's comments in their contest entries. Hopefully, I will have more yarn giveaways soon. They are super fun! And, now back to your regularly scheduled knitting. . . . I plan on spending the rest of this evening working on the second sock. I have been reading here and there that some people were not crazy about this colorway. I am totally fine with that, as everyone has different tastes. And, actually, it worked out for me, as someone on Ravelry saw that I had posted about buying more of this colorway. She messaged me, and now we are trading yarn. I get more of this deliciousness (oh how I want to lick this yarn...it looks like a Sweet Tart!) and she is getting my STR in Grawk that I will never knit with. Everyone's happy! Well, that is it for tonight. Tomorrow will bring some yarn dyeing, I think. I am out of my regular sock yarn to dye (although I am ordering more this week), so I am thinking about playing with some of the other stuff I have around here (there is a skein of merino/silk blend begging to be dyed). When the yarn talks to me, I just do what it tells me to. My friend, Jenni, and I did a little mini-KAL. She finished her socks at least a month ago. Me? I finished them last night. Oh well. We both are proud owners of some Mingus socks, so all is good. Pattern: Mingus by Cookie A. Oh, how I love me some Cookie A. patterns! Time to knit: Ravelry tells me it took a little over two months to complete these socks. That's it for now. I received my July Rockin' Sock Club kit from BMFA today and I think I may start those socks. I am in love with the yarn and pattern! 100 skeins and a yarn giveaway! At one point, I did get a little nuts, and thought the yarn was out to get me. I played dead and eventually, it left me alone and allowed me to get back to work: This colorway is exclusive to The Yarn Stash, but I did dye one extra one to give away on my blog! Hooray for yarn giveaway time! You have until Monday July 28th at 6pm Central Time to submit your entry. One entry per person please. A random number generator will determine the winner. Here are some pictures of the coveted skein: So, that is it. I have been knitting a little here and there to try to keep my sanity, but nothing really to show you. I picked the Mingus sock back up, so that is going well. I am hoping to be done with it by the end of the week. Happy knitting and good luck in the yarn giveaway! Winding yarn. . . .
Be back soon. . . . With a yarn giveaway. This one time, I wasn't busy, but I don't remember when that was. . . . So, yeah, I have been a little busy these days. Summer, I tell ya! Let's see. I will start at the beginning. A couple weeks ago, I went to Green Lake, WI, and I caught a fish: I didn't really knit much on that trip, I really just wanted to show off the picture of me catching a fish (oh, and the chemistry sweatshirt; that thing is awesome)! Then, there was some various last minute wedding knitting for my dear friend, JC. 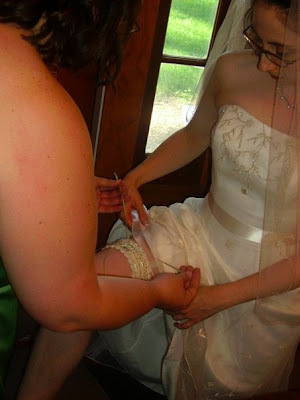 She told me a couple weeks before her wedding that she didn't have a garter and couldn't find one she liked. This was, like, about a week or so after the new knitty came out with the Eloping pattern. Actually, she managed to get the "throw garter" back, as our friend Dan caught it, and I had told all of my guy friends if they caught it, they were to return it to Jenny. I mean, seriously, we are all about 28. They are not going to hang a garter from their rearview mirror. And, if they do, I question why I would be friends with them. :) Although, I guess a handknit garter would be acceptable to me, but I digress. From left to right that's Alex, me, Ang, Ryan, Dan and Colleen. It's the Sunset Picnic colorway. All that lace yarn for $25? Yes, please. Me, Jenni, and a couple other people from our knitting group are going to be knitting Lady Eleanor, and we decided to try to do it with the lace yarn. I am hoping to have a bit of time tonight to start messing around with it. That's it for now. This week the wedding madness starts again. I am going wedding dress shopping with my sister tomorrow night. Then there may be a hot date this week and I am going to go knitting with my peeps two nights in a row. My idea of a good week.